Speedy the cheeky house bunny: Christmas Count Down 11th December! Its another Day closer to the main event so here is the next entry to my count down its from House of Rabbits with one of my pals Zoey!Isn't she a floofy cutie? Don't forget you can still enter all you have to do is take some photos of you christmassy stuff with one of you in it to if you can if not no worries and send it to my mum at [email protected] by 10pm UK time on 24th December for the final post on Christmas day. Here is my den up stairs! My Christmas Card count is 31 and mum and dad 3...hehehe. Please can you keep up with the power of paw for my friends at Brian's Home who are on the mend and Nylablue and her mum who are doing much better too. 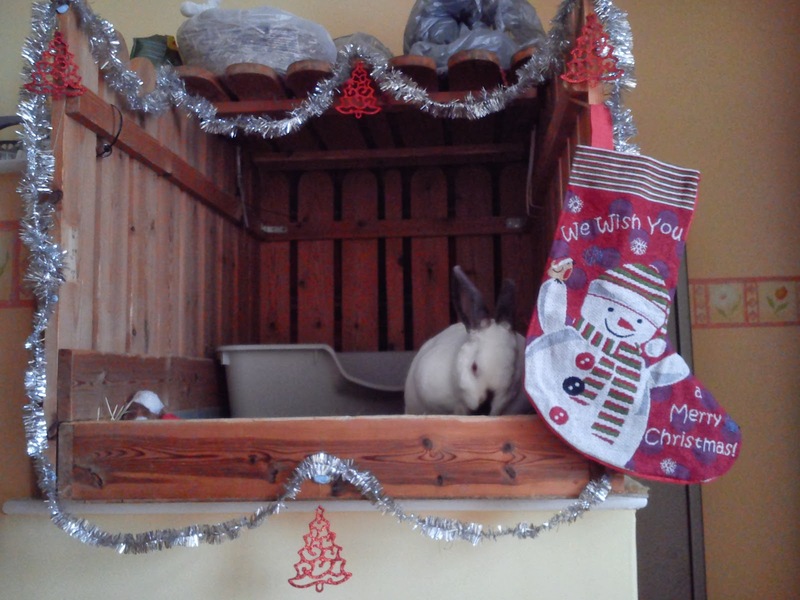 Your home is so festive, Speedy! Oh Speedy you are winning the card race! Oh my goodness - what a bundle of fluffiness!!!! What great pictures. That little Zoey is a very welcome sight, and that other bunny...yes, the one in the great den. Why, I think I know him, too. It's Speedy, my favorite Anywhere nephew. Speedy, I know you are busy, but even though it is warmer and sunny in Austin today, it is probably still cold where Auntie Brandi is. You could, if you have just a sec, hop in the magic closet, give her a snuggle to warm her up, and tell her (again) that I am your favourite Texas Auntie...you know just to keep her warm. Oh, and, "God Save the Queen!" God Save the Queen, indeed! And God save ME! I have to braise myself in a hot shower just to get warm these days. I bet Speedy is toasty with all that rexie floof! Oh Zoey IS a cutie!! Keep forgetting to tell you that I LOVE the Christmas theme of your blog background! speedy your so decked out! I will have to try and enter the contest! Zoey is adorable! 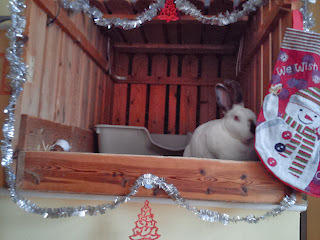 And I love your festive den, Speedy! 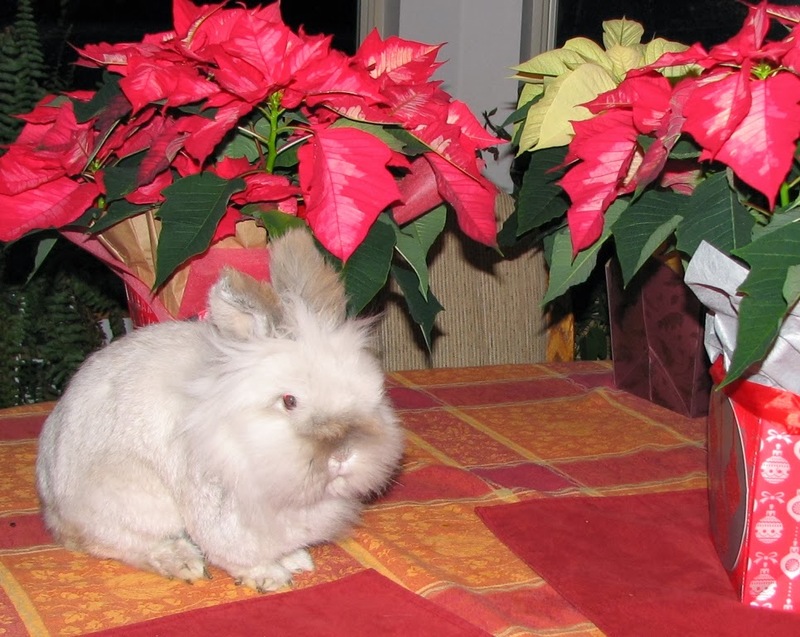 Yow Speedy we LUB Lionhead bunnehz too!! Zoey iz a Siamese bunneh cutie!!!! What a cute bunny Zoey is! Zoey is so cue and we love your space Speedy! Zoey is a super cute bun! And your den does look great too Speedy! Merry Christmas, Rachel and Speedy! I am enjoying all the Christmas trees and decorations! Your den pics are so cool, Speedy! May you have the most wonderful time with family and friends! Your friend Zoey sure is cute! I see you have your Christmas stocking hung up outside the den door Speedy - I hope Santa Paws brings you lotsa fun stuff and puts it in that stocking for you!